Protected * Void / Pychord2 beta Released!! Free your code, Free your mind! You cannot just put a son in the world. You need to take care of it, to suport it, and help it to grow. So, because of this, I’m releasing a new N8X0 version of Pychord. 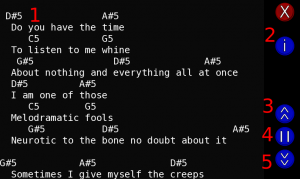 As you know, Pychord is an application to help musicians with song chords. It can be summarized as a Song Book, but it’s not only a song book. Think about having all your musics in a small device with a good screen. Think about fast searches by lyrics. Think on changing music tones on demand! It’s Pychord! So, if you want to test it, get the install file here. First, you need to know the format pychord accepts. It uses a chr file format. Bellow you can see a simple example of a valid chr file. 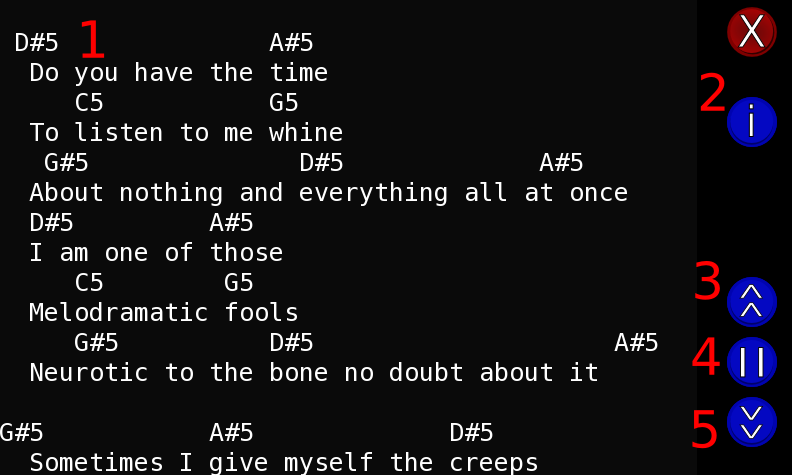 And below we have the chords in pure text. It’s very simple. Take the latest deb file here and install it on your device. After that, go to your “Extra Menu” and open Pychord. Just explaining:  and  are combo boxes with a few options (I’ve tried to keep it as simple as possible). If you want to set a specific local, click on advanced options. ComboBox[1,2] will be replaced by input boxes. And there you can type full paths. When you are done configuring Pychord, just press Save. Suppose that your chr files are in your external MMC. 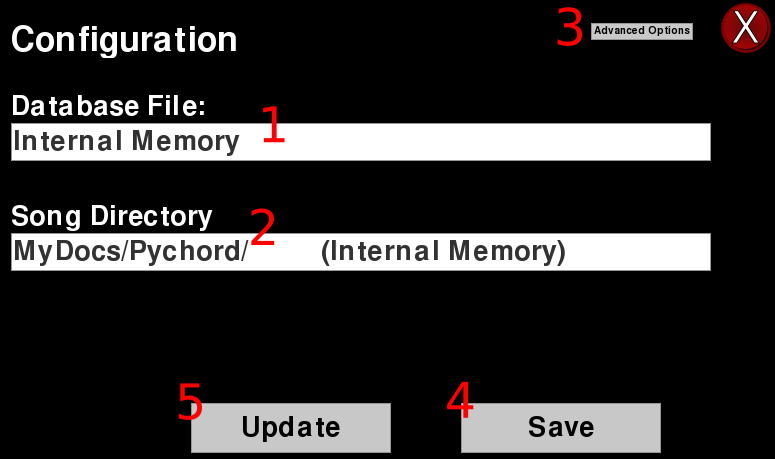 On “Song Directory” select “Pychord/ (External Memory Card)“. Then, click on Save, and click on Update. Probably this operation will take 1 or 2 minutes. Pychord will search by every chr file in “Song Directory” and put this songs in its database. Your files needs to be encoded in UTF-8!!! This very is important!!! Remember: UTF-8!!! One major advantage of using Pychord instead of using conventional songbooks is: Faster searches! Go to pychord main screen and type anything about the song that you are looking for. Now, select the field to be used. It can be the name of the artist ( Artist ), part of the lyric ( Word ) or part of the music’s name ( Music ). Now, click on Search button. In the next screen you will see a list of results. If the result list does not fit in the screen size, it can be scrolled down so that more results can be seen. To scroll the screen just press anywhere on the result list, and scroll. If you want to do a click, just click the screen without moving. 4,5,6 are scroll control buttons. Keep the button 5 pressed and see the song  scrolling. To reduce the scrolling speed, press button 3, and to stop it press buton 4. To change song’s font size, press hardware keys ZoomIn/ZoomOut. Pressing Button-2, a new screen will be displayed. On pychord main screen, click the Playlist button and a new window will be shown. In that window you will find all the songs you have added to your playlist. You can clear your Playlist by clicking in “Clear Playlist” on your Playlist screen. I’m working on an heuristic to recognize whether a line is lyrics or chords. It’s far away from being perfect, but I’m working on it! Pychord is not working with OpenSong format yet because it’s not so easy to create the xml file. I thought of an easy way to put songs into pychord, and chr file was the easiest format I found. But I want to support opensong, and it will happen soon. This is a beta version, the main features are working, but you can find some bugs! PLEASE: WE NEED YOUR HELP! How? So, I’m finishing this post. You are invited to test pychord. I’m waiting your comments. Thanks to Gustavo Boiko, who helped me with this text. Post a comment — Trackback URI RSS 2.0 feed for these comments This entry (permalink) was posted on Monday, April 7, 2008, at 3:19 pm by Danilo Cesar. 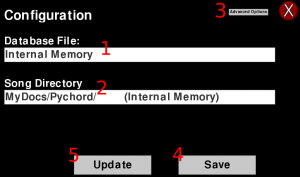 Filed in Linux, Maemo, Python and tagged chord, Maemo, music, musicians, Pychord, pymaemo, Python. This looks fantastic! Congrats on the great work. Ever since I saw your demo on YouTube, I’ve been waiting to see if you would continue to develop it. This might tip the scales to get me to by an n810. « Will GoogleMaps make me lost in Sorocaba? No, maemo-mapper’ll help me!